No Blogging for Old Men: The Small Screen: The Young Pope "Episode 8"
I have been calling for the masterpiece that I knew would be coming from the excellent HBO series The Young Pope, and it may have arrived. I am still deciding if the eighth episode is worthy of that strong of a word, because I still do think the show is capable of even better, but my goodness what a terrific hour of television this was. It is certainly the best of the season thus far. 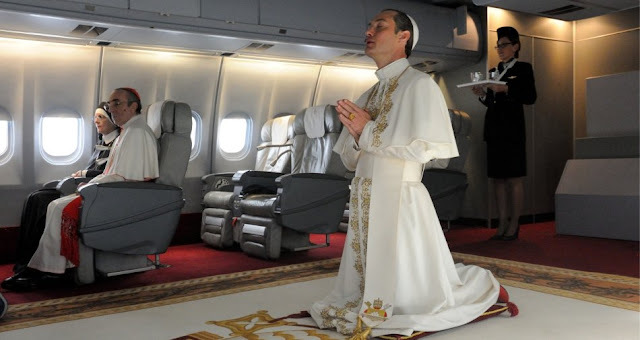 Paolo Sorrentino is quite the storyteller and it is clear that when he focuses on character and emotional depth, The Young Pope absolutely soars. The camera and the narrative really focus closely on Lenny (Jude Law) in this one, with the episode basically unfolding as two separate acts, the first being focused on his internal reflection as he deals with a crisis of faith and whether or not he believes in God, which is a hell of a conflict for the Pope to be facing, and the second act being his trip to Africa which is what helps him rise above his thoughts and find the Lord's voice once again. Sorrentino manages to make this show a work of art at times, with multiple scenes throughout this eighth episode feeling appropriately like a religious experience given the setting of the series and the characters it follows. Absolutely sublime camera work and a script that is always so nuanced and fascinating, if you weren't sure whether or not to give The Young Pope a chance, by god do it. At its worst it's good, and at its best it's one of the best things on television which is a heavy thing to say considering how crowded and great the TV landscape is right now.